MIAMI (AP) — Gone are the days when Miami coach Erik Spoelstra would spend the final few pregame moments wolfing down hot dogs while pulling on his suit jacket and hurrying to the court. The Heat put as much of a premium on fitness as any team in the NBA, and Spoelstra holds himself as accountable as he does the players in that regard. It’s not uncommon to see him ducking out of the team hotels on road trips for a hot yoga class at a place he knows in Detroit, or finding a space in the back of a spinning class in Boston or New York. The season is a grind, and everyone tends to wear down. Most everyone, that is. Spoelstra seems to be an exception. In his 10 seasons as head coach, Spoelstra has led the Heat to wins 58 percent of the time in the first 41 games — and 64 percent of the time in the final 41 games. This season is right on his usual pace: Miami, despite dealing with a slew of injuries, is 24-17 going into the second half which starts at home Sunday against Milwaukee. 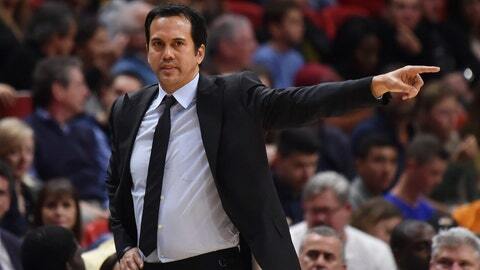 Spoelstra was a guard in college and has always kept a trim physique. He hasn’t played basketball in nearly a decade, giving it up for good when now-Indiana coach Nate McMillan ruptured his Achilles’ while scrimmaging with players in Portland. But with age came wisdom, he’s eating cleaner than ever and always can find the time to work on his body and mind. Having a sister who is a nutritionist helps. So, too, does allowing himself time without his phone in some workouts. And when he needs a different form of relaxation, his Oregon-based family keeps him supplied with cases of wine from the state’s Willamette Valley.